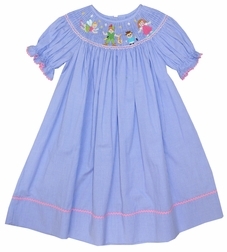 An adorable smocked Peter Pan dress from Anavini. It is bishop smocked with Peter Pan, Wendy, John and Tinkerbell. Peter is holding the alligator's clock and John has his trusty umbrella! Perfect for trips to Disney.